Pendragon is a game of Arthurian legend, most games are sent in the South West or South East of England namely Logres, which the game designers often make the focal point of a campaign. 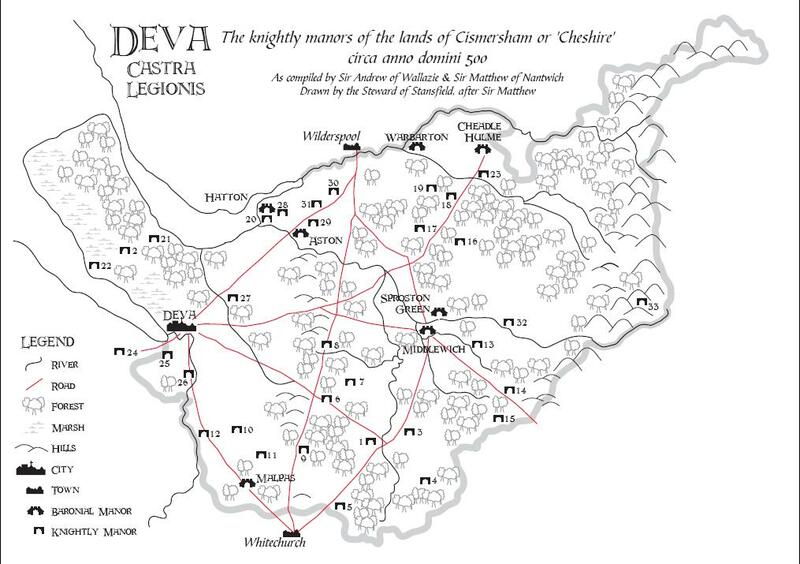 However there’s a whole country out there so I’m running a play by email Pendragon Campaign set in Cheshire. The mix of the Roman (Deva/Chester itself) and the Welsh. Before the Dee silted up Chester was a major port so there are opportunities for foreign PCs and overseas intrigue. The brilliant setting of Beeston castle which while not on the maps is being built in the course of the campaign. The main opponents are the Irish and King Leogandance’s Cameliard which gives a different set of interests to Southern Britons. For a significant part of the Boy King Wars Chester is aligned with King lot – this means come the fall there Grandkids are going to have more varying takes on the rights and wrongs of Mordred and Arthur. There is a very stange cultural superior but politically inferior relationship with the King of Norgales has given of roleplaying opportunties.